This third volume of the catalogue dedicated to publishing the complete paintings, sculptures and drawings of Andy Warhol (1928-87) focuses on the years 1970 to 1974. With the authoritative writing and fascinating attention to detail of the first two volumes, Warhol's works of these four years are comprehensively catalogued and illustrated, with the exception of the drawings to be included in a subsequent volume. At the time this volume begins Warhol had been working at his second factory, his studio at 33 Union Square West, since 1968 and his painting activity had not resumed since his recovery from having been shot that same year. He did not have a painting studio at this building until late 1971 or early 1972 and was instead concentrating on film and sculpture, including the Rain Machine as discussed in Chapter One. It was the acquiring of his first Big Shot polaroid camera that shifted his momentum back to painting again and he began to photograph his sitters, taking 25-100 shots, to capture a personality before beginning a painting. Portraits of key figures of the time demonstrate his development of his new painterly style, mature by late 1972. The Mao Series was the first painting series since 1968, consisting of at least 199 paintings made between March 1972 and August 1973. His Mao paintings premiered in a grand exhibition in Paris in early 1974, and his portrait subjects included many of the most socially prominent and fashionable members of Parisian society, such as Yves Saint Laurent, Helene Rochas, and Sylvie de Waldner, as well as members of the international art world such as David Hockney, the dealer Alexandre Iolas, Henry Geldzahler. His painting style at this time was summed up by Warhol himself as 'sloppy and fast', painting wet-on-wet paint on top of the photographic image and screen prints, sometimes with fingers rather than brush. His style would change again in 1974 but in this volume we see several series and numerous commissioned portraits with this painterly style. He worked on series alongside commissions, and that of the Dada and Surrealist artist Man Ray, the subject of Chapter 5, was a series of some sixty works that developed from a commissioned portrait. 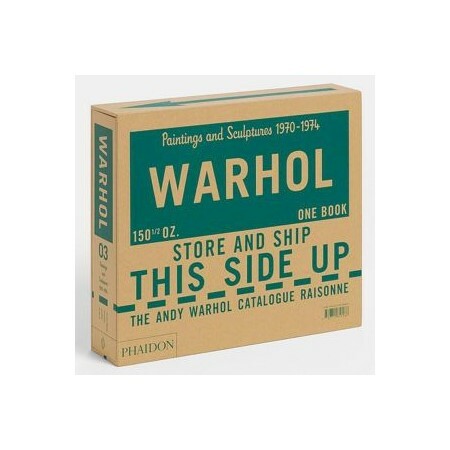 This book includes transcriptions, the diaries Warhol kept in 1972 and 1973, and the Polaroids he took on his travels through Europe and of his subjects, this volume has a strong narrative that presents the artist at a time of great change in his work. The 1970s have been often neglected in studies of Warhol's career and this volume, highlighting his extraordinary engagement with the culture and society of the time, brings to deserved attention the work of the first four years of the decade.